Today is the first day of Spring! Let’s make this a time of hope and optimism for the community. Starting today until March 29, 2018, we are participating in the Mississauga Food Bank’s Spring Food Drive. 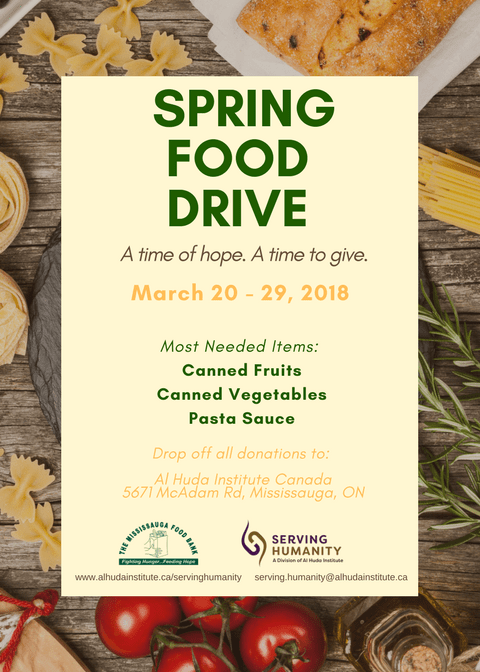 Donate non-perishable food items and drop them off to Al Huda Institute, 5671 McAdam Rd, Mississauga. The most needed items are canned fruits, canned vegetables, and pasta sauce. Food items can be dropped off in the food bins located at the front entrance and the back of the prayer hall. Spread the word to friends and family and help us feed our neighbours!